Members of the South Africa team. Christia Whitacre is in the upper right. 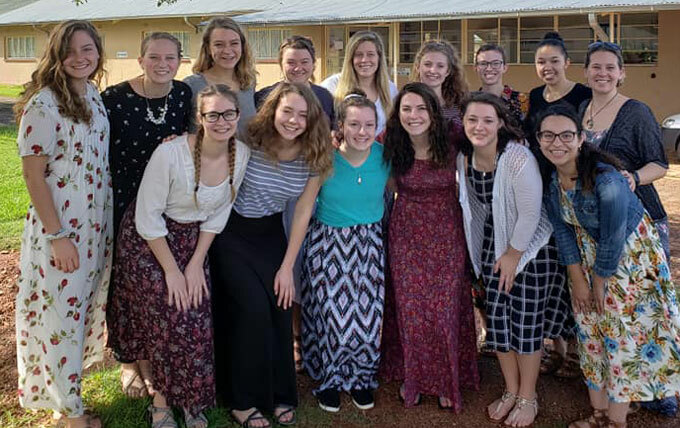 In May 2018, Arthur Wilson, Dean of Spiritual Life and campus pastor at Huntington University, approached UB Global about the possibility of a trip to Africa with students. We thought of Impact Africa right away, which has a solid program for short-term teams. UB Global missionary Nichie Parish Stonall serves with Impact Africa in Johannesburg. The group of 18 traveled during Huntington’s J-term. Christia Whitacre, whose husband Kevin is pastor of Anchor UB church (Fort Wayne, Ind. ), came as one of two chaperones. And, congratulations to Nichie and Chris Stonall, who were married in South Africa back in July and were able to celebrate with US family and friends in December! On November 29, the Haupert Institute for Agricultural Studies hosted its third annual Harvest Celebration in Huntington University’s Habecker Dining Commons. Mitch Frazier, CEO of Reynolds Farm Equipment, was the featured speaker. His presentation focused on historic waves of innovation in the agriculture industry. Reynolds Farm Equipment began providing agricultural equipment in Fishers, Indiana, in 1955. Since then, the business has expanded to include locations throughout Indiana and in Kentucky and Ohio and has become a leading equipment dealer. 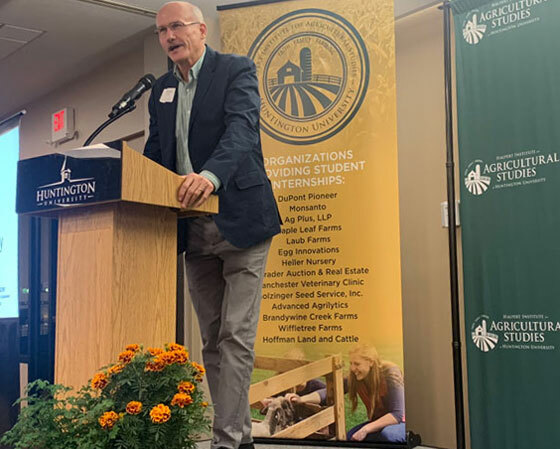 In addition to Frazier’s keynote address, the Harvest Celebration included a complimentary dinner, a recognition of the Haupert Institute’s sponsors and remarks from current Huntington University agribusiness students and members of the Ag Advisory Council. The Haupert Institute for Agricultural Studies opened in the fall of 2015 and promotes a Christian perspective on agriculture which recognizes the responsibility to be good stewards of God’s creation. The Institute is intended to help meet the growing need for agriculture professionals and offers eight concentrations in agribusiness as well as an agricultural education degree. 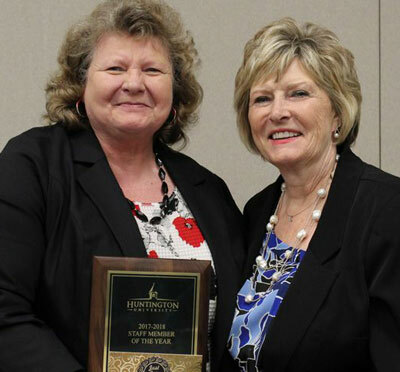 November 15 was Huntington University’s second annual Day of Giving. With the help of 142 donors (up from 130 in 2017), they raised $76,675 for the Forester Fund (the goal was $75,000). Over 90% of HU students receive funding from the Forester Fund. Thursday, Nov. 15, is Huntington University’s second annual Day of Giving. Contributions help build the Forester Fund, which provides scholarship dollars to 92% of HU undergraduates. There are extra reasons to give tomorrow. Generous donors will kick in extra money when certain goals are met, so your contribution goes a lot farther. $10,000, when HU raises $10,000 on its own. $10,000, when 20 new donors have given any amount on Day of Giving. $5,000, when 5 individuals make a gift of $1000 or more. $5,000, when 50 graduates from the classes of 2008-2018 make a gift of any size. In addition, anyone who contributes on November 15 during the two hours of 11am – 1pm will get a 20% digital coupon for the HU Bookstore. And don’t forget the tax credit for Indiana residents! There are other ways to get involved. Follow this link. 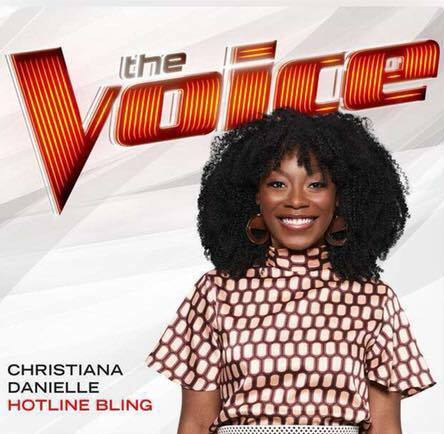 Christiana Danielle, a 2017 Huntington University graduate, has made it past the opening rounds of The Voice. Tonight, the live playoff rounds begin. And now, viewers can start voting. It would be great to have a Huntington University alum as a winner of The Voice! At HU, students and others will gather at the Merillat Center for the Arts to watch the live show in Zurcher Auditorium. Free snacks from The Party Shop, JJ Java, and Sugar Mama’s Bakery will be available, along with a limited supply of Christiana Danielle shirts. The show will start at 8:00 p.m. The alumni office sent out this information about how to vote. There are several different ways. If you have the Voice app on your smartphone or tablet, you can vote up to ten times on each device. Voting is in real time, so you need to watch the Voice for the official voting times. 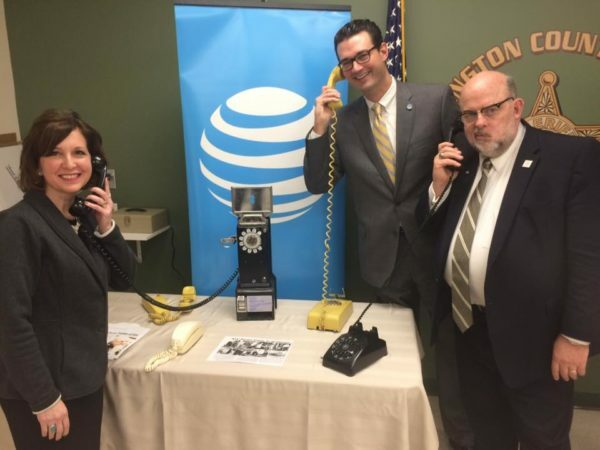 Demonstrating 1968 phone technology are Mayor Brooks Fetters (right) with Indiana state treasurer Kelly Mitchell and AT&T Indiana president William Soards. 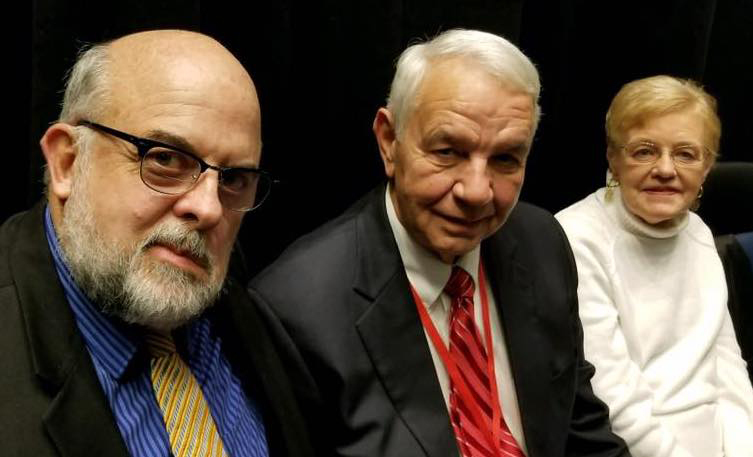 Brooks Fetters (left) with Ken and Kay Sunseri at the commemoration in Washington, DC. Ken is the current mayor of Haleyville, Ala., and Kay’s father was mayor when the first 911 call was placed in 1968. During February and March, events were held to recognize the 50th anniversary of the Emergency 911 call system. Congressman J. Edward Roush (right), a Huntington University graduate and United Brethren member, led the crusade to implement the system. Brooks Fetters, mayor of Huntington (as well as an ordained United Brethren minister), was part of a group from Huntington that traveled to Washington DC for a commemoration of the 911 system. Also participating was a large contingent from Haleyville, Alabama, where the first 911 call was made on February 16, 1968. Huntington was the first US city for which Bell Telephone (owned by AT&T) instituted 911 service. Congressman Roush placed the first 911 call to a local policeman on March 1, 1968, placing a call to a local police officer. During that first week, 13 calls to 911 were made by Huntington residents. Prior to that, people had to dial “O” for the operator or look up the specific number for the various emergency services (ambulance, fire, police, etc.). Now, thanks to the efforts of Congressman Roush, 240 million emergency calls are placed to 911 every year across the country. A recognition was held to mark the March 1 anniversary in Huntington. Participating were Indiana State Treasurer Kelly Mitchell and William Soards, president of AT&T Indiana, along with Mayor Brooks Fetters. A US flag which had flown over the US Capitol was presented in honor of Congressman Roush (made possible by Jim Banks, who now represents the Indiana 3rd District in Congress). 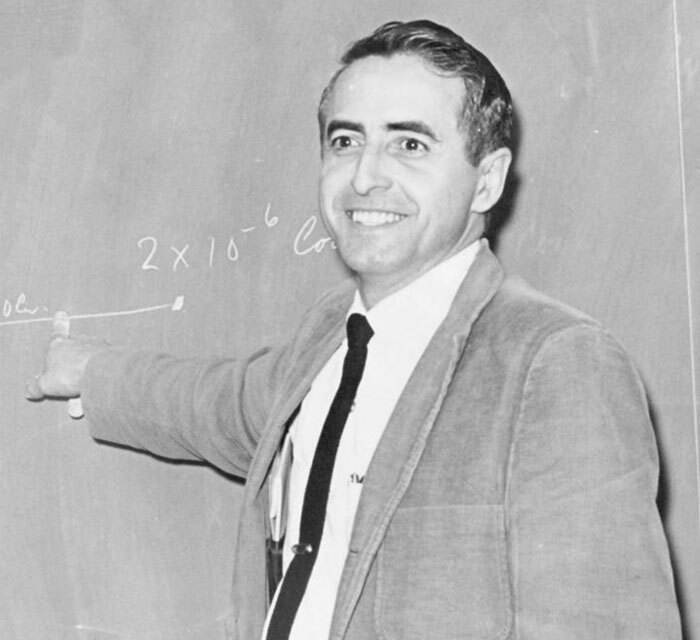 Dr. Roush graduated from Huntington University in 1942, and then served as an officer in the US Army in the European theater during World War II. He served six terms as a Democratic Congressman, followed by several years as director of the Environmental Protection Agency. 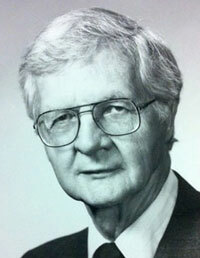 He was an avid supporter of Huntington University, and even served as interim president in 1989 while President Eugene Habecker was on sabbatical. He was also the denominational legal counsel and served the denomination in other capacities. Ed and Polly Roush were longtime members of College Park UB church in Huntington, Ind. He passed away on March 26, 2004. Roush was the subject of this “On This Day in UB History” post. The first city in North America to use an emergency number was Winnipeg, in Canada. They used the number 999, which had been used in England since 1937. They switched to 911 after the United States proposed using that number. Mexico used the number 066, but in June 2017 the entire country switched to 911.